What’s going on these days with the most generous donors of all? How are they changing? What are their expectations of us? What do they really want? Do you ever wonder…How can I reach them? 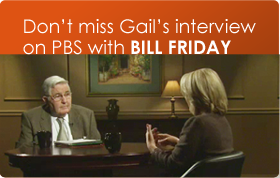 How can I appeal to their big hearts, and develop warm and trusting relationships with them? Today, to help you nail your next major gift, here are 5 critical major donor trends to watch. Across the board, there is a steady decline in trust of society’s institutions, including nonprofit organizations. This emerging distrust carries over to your major donors, who are generally wary about how NGOs are using their money. According to a recent Fidelity study, more than 8 in 10 donors say they have concerns about how their donations will be used and if their gifts will really make a difference. This is huge! They expect to know who YOU are. Your donors want to get to know you, and to find out how you make a difference. They are influenced by your brand and visibility. Investing in your brand probably pays off handsomely because it establishes you as an organization of note. 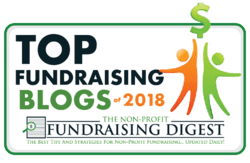 Build trust with your major gift prospect via one of their own friends, or one of your existing donors who can attest to your organization’s impact. When we add “seals of approval” to our site and materials, we will raise more money. A recent, fascinating study found that nonprofits who earned Guidestar’s Seal of Transparency gained an average of 53% more contributions a year later! When you publish endorsements from government officials and community leaders, you can also demonstrate credibility. 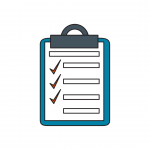 You can include ratings from Charity Navigator, Better Business Bureau, or Guidestar to establish trust and credibility. Use infographics to demonstrate your reach and impact. Talk about awards or recognition achievements your organization has received. All these things matter to those who give. We’ve seen this trend growing over the past decade – donors are increasingly focused on making an impact with their giving. Fidelity found that 65% of wealthy donors would give more IF they knew the impact of their donations. To me, this is the biggest obstacle holding giving back. We have a huge inability to clearly, succinctly explain to donors how their gifts are making an impact. Encourage donors to designate their gifts so they can see a direct impact. Many studies have shown that people will often give MORE if you let them designate their gifts. Even if someone makes an unrestricted major gift to “operations,” they understand why and what that will achieve. The West is experiencing an economic boom, and new wealth is being generated all over the world. Clearly, the pie is getting bigger. Take heart because those who feel more financially secure will give more. There is more money in play to give to charities these days. And, the wealthy are holding many kinds of assets. Assets outside of cash. Remember, only 1% of wealth in the US is held in cash according to Russell James. This is the secret source of gifts many fundraisers ignore. Contributions from donors at the top of the income scale have increased significantly in the past 10 years. For example, gifts from households earning $200k or more comprised 30% of all charitable deductions. Yet, in 2017, these gifts accounted for 52% of all deductions. 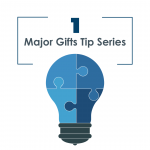 Educate your board members about how major gift fundraising works. Show them how they can help. 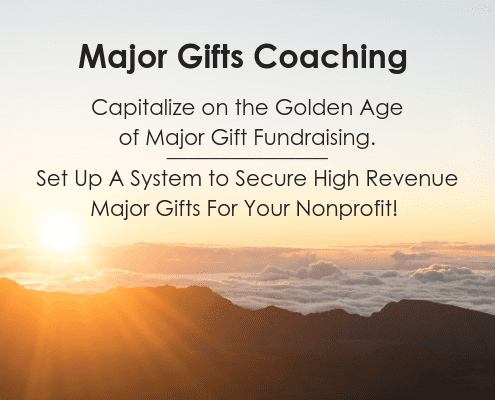 And join our major gift coaching program for 2019 to make sure your organization nails major gifts that are out there for you – we will be closing out our 2019 class soon! I absolutely loved the workshop. I also thought that the honesty of the Board was excellent.